You are here: Home / Access Equipment / Scissor Lifts / What’s a White Card? Everyone who does any kind of construction work in Australia is required to hold a White Card, from apprentices to site supervisors. A White Card certifies that the worker has undertaken basic, entry-level training in occupational health and safety. The White Card system replaces the old system of each state having its own rules and training requirements. In NSW, for example, they had a ‘green card’, in Victoria, the card was red, and there was a blue card program in Queensland. Some states recognised other states’ training programs and some didn’t. The White Card, while issued by the state, is recognised nationally. This helps when workers move around from state to state. At Force, we put a high priority on occupational health and safety, so the evolution of White Card training is of interest to us. Government projections estimate a 12% increase in construction employment by the end of 2017, so that means 131,000 new people will be issued white cards. 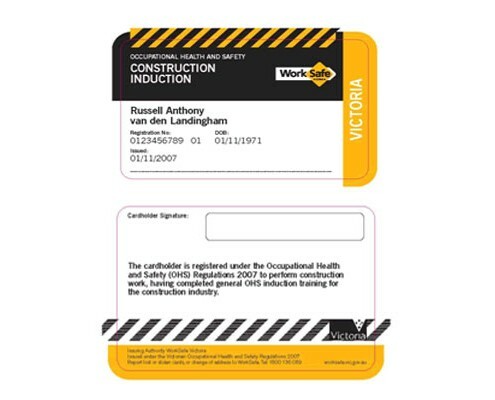 In order to be issued a white card, you must first find a Registered Training Organisation, and then take a course that includes all the basics: recognising safety signs and symbols, personal safety equipment and how to wear it, risk management practices and safe work practices for specific areas. The course can be taken on line, and that’s becoming a concern to the Australian Skills Quality Authority (ASQA). The Authority has done an audit of White Card training across the country. For those training face to face, the course takes about 6 hours. For those taking it over the Internet, course time might be as little as one hour. ASQA is concerned that those taking the course online really need to have some hands-on training, and is recommending that, even if you take the course online, the assessment (exam) should be done in a simulated work situation. ASQA is conducting a curriculum review and hopes to have a better system working by the end of 2015. Force was the first elevated work platform rental company in Australia to obtain AS/NZS 4801 National Health and Safety accreditation, so we are committed to safety on the job. All of the operator trainers we have on staff hold a Yellow Card. This is the certification required to operate a scissor lift up to 11 metres. 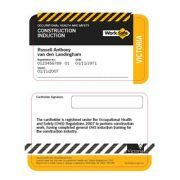 The Yellow Card is the Elevated Work Platform Association of Australia’s Certificate of Competency. EWPA offers all kinds of specific training: specific training in telehandlers, for example, and another course on scissor lifts. We offer training that isn’t specific to a type of lift, like load restraints for EWPs, as well. To operate a lift, you have to be licensed to operate the lift, and usually a High Risk Work Licensing certificate from WorkSafe Australia is also required. Make sure that you have the specialised training you’ll need to do the job safely. If you’re not sure what that means, then please get in touch before arranging access equipment hire. https://www.forcecorp.com.au/wp-content/uploads/whitecard-equipment-safety-495x400.jpg 400 495 forcecorp https://www.forcecorp.com.au/wp-content/uploads/force-access-e1523362879600.png forcecorp2015-01-15 21:16:122017-02-27 14:44:17What’s a White Card?